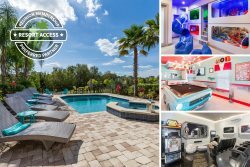 Oasis Belle | 6 Bed Vacation Home rental in The Retreat at Champions Gate, Amazing Games Room and Movie Room! Brand New! Oasis Belle | 6 Bedroom Pool Home at the Retreat at Champions Gate with Amazing Games Room and Movie Room! We had a great time and the house was great. The layout of the home was great for our group of 11! We had a wonderful time. The places we went to were very busy so it was nice to come home to a quiet house with a beautiful heated pool. We are looking to book 20 days in Champions Gate next December. We recommend renting a house for everybody who wants to go to Disney! We had a wonderful week at the house, the kids enjoyed a lot and the adults too. We just loved it and everything was perfect!